For many of us, bumper crops of zucchinis and cucumbers conjure up the sweltering days of summer, while pumpkins and gourds decorate our holiday tables throughout the fall. However, these iconic fruits and vegetables—known collectively as cucurbits—can also help us understand the spread of plant diseases that pose a significant risk to crops. I recently led a study that used crop species from two genera of closely related plants belonging to the family Cucurbitaceae—zucchini, pumpkin and squash, which are all in the same genus (Cucurbita) and are native to the Americas, as well as cucumber and muskmelon, which both belong to a genus (Cucumis) that is originally of Eurasian origin. I used these closely related, native and introduced Cucurbitaceae crop plants as a model system to understand how and why plant pathogens emerge. For this study, I collected 88 samples of Erwinia tracheiphila from across these two host plant genera in the eastern United States and sequenced their entire genomes. E. tracheiphila is a pathogen that causes bacterial wilt in these species of cucurbits, resulting in tens of millions of dollars in crop losses and prevention costs to U.S. farmers each year. Yet, lack of basic knowledge about this pathogen means there are few control methods available for farmers. E. tracheiphila's genome is like Frankenstein's monster—cobbling together lots of different pieces of genes and DNA from different sources, suggesting that it has recently undergone dramatic changes. There was also very little genetic difference between the genomes of the 88 different samples. From these genomic data, I determined that E. tracheiphila evolved as a pathogen only recently. My colleagues and I also found three distinct bacterial lineages. Surprisingly, we also found that cucumbers are the only host plant susceptible to all three lineages, and the most susceptible host plant species overall. This is notable because, while pumpkin and zucchini are native to eastern North America and have been present throughout the Americas for millions of years, cucumbers and muskmelon were only introduced to North America after European colonialization in ~1500. This strongly suggests that the introduction of a foreign crop plant, followed by widespread cultivation in eastern North America, inadvertently caused the emergence of a new, very damaging plant pathogen. 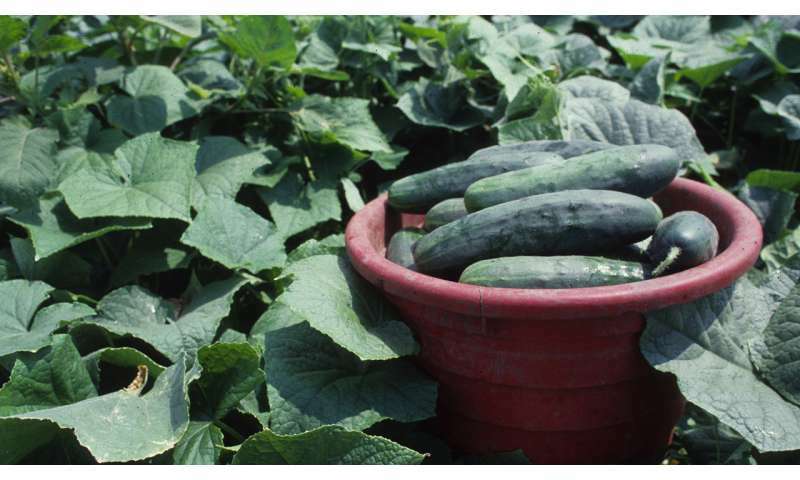 Our findings strongly suggest that the way cucurbits—especially introduced cucumbers—are grown in intensive monocultures, combined with the local climate, all contributed to creating a new ecological niche into which this new bacterial pathogen emerged. This set of circumstances gives us an exciting opportunity: Since the temperate eastern United States is the only place in the world this pathogen occurs, we can dissect—aided by information in the bacterial pathogen genome sequences—why the local climate and agricultural practices have driven the emergence, persistence and evolution of this agricultural pathogen. This may give us important insights, since more modern North American monoculture practices seem to be an important contributor to this specific plant disease outbreak. Monoculture refers to the intense growing of large populations of the same host plant species, rather than growing multiple crops in the same field, such as is the case with ancient Mexican milpa polyculture cultivation systems. To put this in historical terms that may be more familiar, E. tracheiphila has notable parallels with the Black Plague pathogen Yersinia pestis that killed up to half of Europe's population in the Middle Ages. Both E. tracheiphila and Y. pestis show similar dramatic changes in their genomes. These changes allowed both pathogens to emerge into large, dense, genetically similar host populations—humans in the case of Y. pestis, and cucurbits in the case of E. tracheiphila. The recent emergence of E. tracheiphila is a landscape-level problem, and cannot be solved by individual farmers. Our research shows that our modern agricultural practices—while producing unimaginably high yields—also have unanticipated susceptibilities to microbial pathogens. This result should give us pause, and motivate us to think much harder about how to structurally protect our agricultural systems—at the landscape level—from pathogens like E. tracheiphila in the future.